Blink Network brings all of our EV charging station information to one place. 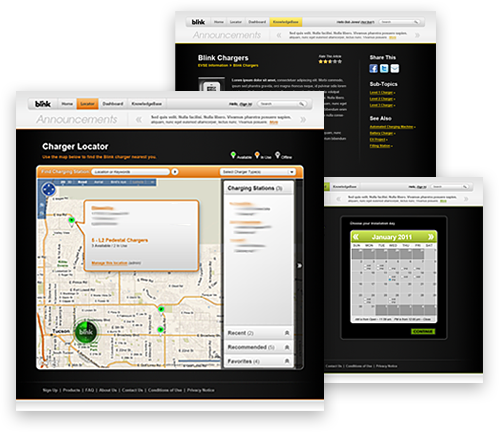 Via the Blink Network website or Blink mobile app, drivers can locate public EV chargers and see real-time station availability. EV charging sessions can also be started via Blink mobile app or ciustomer support. Drivers can also login and manage their Blink Network account, including personal info and billing, and EV charging session notifications.Become a Blink Member today and take advantage of enhanced Blink Network capabilities. Blink Network also supports property partners with the ability to manage one or multiple Blink EV charging stations, access standard and customized reports, set up customizable gauges to monitor key metrics, set up role-based permissions, payment processing, security features, remote troubleshooting, and advertising opportunities. everything there is to know about your EV. The Blink Network allows you to customize how you want to receive important information about charging events such as: charge completion or interruption of charge and payment authorizations, among others. The Blink Network will notify you via email and/or text messaging. Login to set your preferences. The Blink Network Map shows all Blink charging locations on a rich and interactive interface. It reports near real-time status of Blink charging stations to allow you to identify an available charging station location and get directions. You can select the type of charging stations they are looking for based on charger type (Level 2 or DC Fast Charger) and availability. Accessing the Blink Network's powerful features are easy. Sign up for a free membership today. There's no annual fee, membership cards are free, and you can save money. Join Blink today.